Mattox Law is a member firm of the ARAG legal insurance provider. As such, I am frequently able to represent my clients at no expense to them or at the very least at a very discounted fee. In many instances, this legal insurance program is offered through employers as a benefit. If you have ARAG legal coverage please contact my firm immediately so that we can discuss your case and what we think we can do for you. I offer free consultations and would be happy to duscuss your case with you without any obligations on your behalf. 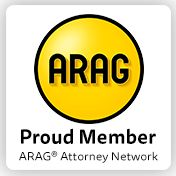 If you choose to move forward with my firm I would simply need your ARAG case assist number.